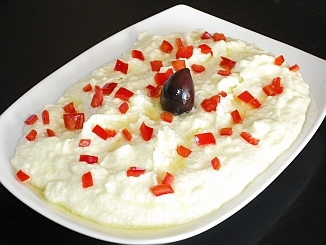 This is a traditional spicy cheese dish, which can be served as a meze with ouzo or beer, or as a dip. It is quick and easy to make. Garnishing with chopped sweet red peppers (see photo) is optional, though normally it is not done. The red peppers do add a refreshing flavour to the dip, though. We specify that you should use young, tender chili peppers - the reason for this is that if you don't, then you will have to grill the peppers until they colour and then remove the skins. With young, tender peppers, this is not necessary. Wash the peppers, remove the stalk and the seeds. Put all the ingredients in a liquidizer and mix them well. Place it in a bowl and sprinkle with some olive oil and garnish with chopped sweet red peppers if you so wish. This looks great! I am always looking for great new recipes for dips - and since I am in love with feta, this I am going to have to try!